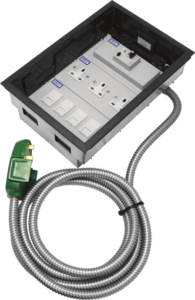 Olson Electronics has expanded its portfolio with a range of cavity floor boxes and plates, providing power and data distribution for modern office environments. The new floor boxes and plates are made from robust steel and utilise a module sized plate system. Available in 87mm and 100mm depths, the new design provides easy access for wiring and installation of accessories, with the base being of a single piece construction steel body and each compartment having four entry knock-outs for flexible conduits or cable glands. The internal compartment segregation plates can be moved to suit the module based configuration of the power and data plates used within each unit. The sub-frame allows for fine adjustments to accommodate uneven flooring, with a reversible self-closing lid which is recessed to allow for carpet infill. A durable, robust sub-frame supports the lid in case of high traffic environments. Olson offer a wide range of power, data and telecom sockets to meet all the requirements of a raised floor system, including a rarely offered MCB/RCD/RCBO mounting plate. This flexible design enables the boxes to be easily modified to any configuration with ease. Olson also offers a bespoke and pre-wired configuration service.